"Class of 1961 Gift -- College Seal Sign and Scholarship Fund"
The class of 1961 gave the college a large sign displaying the college name and seal and was erected on the wall of the Pacement Bureau. The remaining funds were set aside for graduate school scholarship loans. 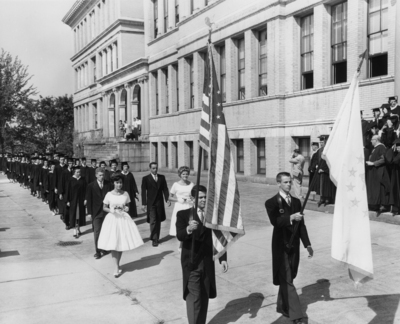 The photo is of the class of 1961 commencement procession passing by the former University of Rhode Island Extension building on Promenade Street en route to commencement exercises at Veterans Memorial Auditorium.